Maureen and I purchased a wonderful, historic house in the walkable, historic, and romantic Duckpond neighborhood in Gainesville on Halloween. It is only a few blocks from my current home in the neighborhood. I did an exhaustive title search to assemble a history of ownership on the house that reaches back to when it was built in 1913. The house has a pleasant location on a very neighborly street. The street is very narrow, with on-street parking, sidewalks and nice street trees. Half of the residents on the street are government employees that I know as friends. Five-minute walk to downtown. One minute walk to my office (which is located on the historic Thomas Center Gardens). Two-minute walk to a linear park and creek. Two-minute walk to a small neighborhood park. When I first walked through the house during an open house, I thought to myself "This is an 'okay' house. I could possibly live here. Not bad." But over the next few days, though, it grew on me exponentially. After two days, I was obsessed with it. I told Maureen that we MUST buy the house! I was possessed! I could think of nothing else, and was convinced that I would do ANYTHING to buy it! It had become obvious that it was fantastic in so many ways, and I was not sure why that was not immediately obvious to me during my first visit. I guess it all just sank in as I thought about it. A photo of the house is below. Sometimes you don't really know what you want in a house until you see it. That's what happened to Steve and Mary Reid and the home they fell in love with on first sight in the Duck Pond area. But what makes their story unusual is that Steve Reid had actually seen the house before-in fact, he had eaten dinner there almost every night for a year. The Reids and their 1-year old son, Steven, now live in that home on NE 4th Street known as the Kelley-Swords house. Two years ago the Reids were planning to move from their northwest Gainesville home. Reid, a neurosurgeon at Shands Hospital, and Mrs. Reid, a registered nurse, had purchased a 3-acre lot in Kanapaha Gardens, southwest of town. Their architect had drawn up plans for a contemporary house. One Sunday afternoon, the Reids visited an antique show at the Thomas Center. While they were in the area, Reid wanted to show his wife the house where he had eaten his evening meals while a first-year student at the University of Florida. He couldn't remember exactly where it was. "We drove around the block two or three times and I said 'I'm sure it was around here somewhere but I can't find it.' So we went on in to see the open house and after I got inside and I looked around, I recognized it immediately." What had confused Reid at first was the change in the home's exterior. The screens had been removed from the front porch. Palmetto trees were gone from the front yard, and there was a new picket fence. A fresh coat of paint and some repair work also disguised the house. But once inside the front door, Reid knew immediately where he was. And so did Mrs. Reid. "As soon as we walked in we felt like we were home," said Mrs. Reid. As they walked around, she kept leaning over to her husband and whispering, "I love this house. These colors-these are my colors. This house was made for me." Reid answered, "Now listen, we've already got plans drawn. Don't get your hopes up." "There's a way," said Mrs. Reid. "I mean, after seeing this house, that other house was nothing. The architect did a nice job on the plans-but we wouldn't have liked it." A few months later, the Kelley-Swords house, built in 1913, was theirs. Reid, a native Floridian, saw the house for the first time in 1974. He was a busy, first-year medical student then, and a friend told him about a "supper club" that served home-cooked meals at a reasonable price. Reid ended up eating almost all his evening meals at the house, run by sisters Louise and Mary Ellen Swords. It's not just the house that pleases the Reids. They also love the neighborhood. "When we lived in the suburbs," said Reid, "I knew the neighbors on either side of me, and that was it. In this area, everyone is working, but people get out and walk in the evening. If you're walking someplace you've got a destination at the end. It's not just around the block and all the houses look exactly alike. It isn't like that. "The people up the street here have just finished renovating the big gray house. We've walked up there and we've watched the renovations-we've talked to them. They've come down here, they look around. You sit out on the porch and you talk to people as they go by. It's very comfortable. "I don't even know what words to use to describe it-it's just you feel close to them. You see them at different events. You walk up to the Thomas Center on a Saturday for one of the children's programs and you see people that you know. They say, 'How are you doing?' And everyone is going to walk home afterward. You're not isolated by an automobile. "We walk down to the duck pond. We walk downtown just to see what's new. There's always something new going on at the plaza, and something cultural going on at the Thomas Center." The sense of community Mrs. Reid finds in her neighborhood is something she grew up with in a small town in Wisconsin. "The city park was only six blocks from our house. It was an easy walk over there. Everything was very close. Our church was on the corner. The store was here. Granny was there. It was nice. It made more of an impression on me than I realized," she said. Reid also remembers a small community, the Opa Locka of his childhood. "Down the street from their house was the Ben Franklin and the drugstore," said Mrs. Reid. "They used to go in and get milk shakes. City hall was a mile down the way. It was very pleasant and they knew all their neighbors." The history of the Reids' house was researched by Melanie Barr, a Gainesville historian and a historic preservationist. It was built for G.H. Kelley, who was in the sawmill and crate-manufacturing business. The house was strong enough to support a clay tile roof. There were no other frame houses, particularly two-story houses, with tile roofs, according to Barr. "The wood is like fiberglass," said Steve Reid. "It's pine. The floors are heart pine. I don't know if the resins in the pine have polymerized over the years or what, but it's just as tough as it can be when you need to drill a hole in it." The Kelleys sold the house in 1917 because of fire that destroyed one of their sawmills and led to financial difficulties. The house was then owned or rented to University of Florida professors and their families: Porter Rolfs, Edward W. Garris, Alfred Crago, John Ingle, Martha Murphree Wallace, and James Thurston. In 1952, the house was purchased by the Swords family. The Swords sisters, Louise and Mary Ellen, ran the private boarding house-style restaurant, always referred to as a "supper club," from 1957 to 1977. If the words supper club conjure up images of cigarette girls and stand-up comics, think again. This Gainesville supper club was a private eating establishment with a family atmosphere, where pillars of the Gainesville community gathered. "It was a real good deal for students," said Reid. "Ten dollars for dinner Monday through Friday." "We waited on the front porch. Every evening at 6 o'clock on the dot, Louise Swords would come out with the bell, and she stepped out onto the front porch to ring it. That was the cue for everybody to file in. Usually there were 10 or 20 people waiting on the porch. A few more would file in later. She probably served 20 to 30 people a night. "It was just the two of them cooking, serving, and cleaning up. They had similar menus each night of the week. Each Monday night it would be the same thing. One of the best dinners that they would have was macaroni and cheese." Students were only a minority of those who ate there. "There were lots of people," said Reid. "With many of them I didn't really know their importance in the city until years later." "After a while everyone sort of had his own seat. For a new person to come to the supper club, they had to be invited by a person who had been going there for a while and he had to talk to Louise first to make sure it was going to be OK to bring somebody new," Reid said. Interviewed at her home in the Bailey Retirement Center, Louise Swords recalled some of the guests she used to serve at her supper club. "Dr. Reitz (former University of Florida president) and Mrs. Reitz. Her mother ate there all the time, and they would join her sometimes. Ed Turlington, county commissioner, and Mrs. Turlington were often there. Dr. Frank Goodwin, an English professor, and Mrs. Goodwin. Lee Graham, who was president of First National Bank, and his wife. And people from the First Methodist Church." "Louise was a wonderful person. You had to admire her," said J. Wayne Reitz. "There really wasn't anyplace better to eat in Gainesville." When asked how much she charged for a meal, Louise Swords replied with a laugh, "Not enough!" Her sister, Mary Ellen Swords, who also lives at Bailey Retirement Center, put it this way: "Nothing-she gave them away. I think she started off with a dollar and a half. Then she went up to about two fifty." When the Reids walked in on that Sunday afternoon two years ago, Jane Myers, a Realtor, was there working on the house. Mrs. Myers and her husband, Gardiner Myers, a professor at the University of Florida, have lived in the Duck Pond area for 16 years. They have restored a number of homes there. The couple purchased the Kelley-Swords House when the Swords sisters moved to the Bailey Retirement Center. "It had a wonderful floor plan even for today's living," said Mrs. Myers. "A lot of people like to cut up rooms and create new space but that's not our idea of restoration." Instead the Myeres like to clean, repair and bring the house to a state of modern convenience without much alteration. "We felt this house particularly should not be cut up," said her husband. "The floor plan was very good for a single family. But it was in such a state that most people getting hold of it would have cut it up. We felt we could see turning it into a very nice single-family dwelling. It would make a terrific house for that, and we knew how to do it." Houses in the Duck Pond area range in price from $30 to $55 per square foot, according to Mrs. Myers. The lower price would be for a house with no "curb appeal" and not much done to restore it. This was the 12th old house the Myeres worked on, and the sixth major restoration. "There are tricks you learn by watching other people," Myers said. "There's a lot of expertise out there and if you're not ashamed to listen to people and watch people, and if they don't mind you wandering around watching what they're doing, you can learn a lot." The Myeres did not make many architectural modifications. They converted the butler's pantry into a laundry room, and added a closet upstairs. They constructed a master bath and a second bath upstairs from one bath and a closet. There were five fireplaces, two with gas logs and one being used as a flue for a gas space heater. They removed the space heater and restored the original fireplace. The house now has three working fireplaces and two with gas logs. The couple made big changes in the kitchen. "Usually with a kitchen you've got to start over again," said Myers. "The old stuff usually isn't that good. "Frequently, as in this case, there's a lot of damage from modifications and from water. The cabinets that were in there were not good at all. They were metal. So we just gutted the place and started over. It's a new kitchen. "People like old houses but they like new kitchens, so that's not the place to get too 'cutsey-poo,' going to the original. You'd end up with a little tiny sink and an old stove." Cleaning and repairs were tedious. "We spent many days just pulling windows, reworking. Some of them had gotten a little off. But just replacing sash cords! I'm enough of a professional that I put sash cords on the top and bottom. Some people do over houses and they seal the upper sash in place and then replace the cords in the bottom half. "That really defeats the purpose of the tall windows. You drop the upper sash and the hot air escapes. There are a lot of houses in Gainesville that have been renovated in (the wrong) fashion. Even if you have central air conditioning can escape it for a month or two in the spring and fall by doing that [dropping the upper sash] and having ceiling fans." Three sets of sliding pocket doors made of wood paneling needed work. Upstairs the doors had transoms that the Myeres brought to working order. The house was full of paneling, most of which had been painted many times with oil-based paint. A man hired to strip and refinish the family room took three months to scrape it down by hand, put chemicals on it, scrape some more, and sand, sand, sand. When they were finished the Myeres had uncovered a post-Victorian house showing the influence of a number of different styles. "It's a fairly plain exterior, said Mrs. Myers. "I think it's remarkable that when you get inside the floor plan is very comfortable-quite modern actually. It has a family room, living room, big dining room, eat-in kitchen. Upstairs there is a master suite along the south side with study, bedroom, dressing room, master bath, and a nice little porch off the bathroom. On the other side of the hall are the other bedrooms and a bath. "It's not pretentious. It's not ornate. It was a comfortable middle-class home, with about 2,200 square feet." The Reids loved the house but they didn't buy it immediately. "They were like all buyers are when they see something old," said Mrs. Myers. "They immediately think of all the trouble and things that could be wrong with it. The Reids had people check it out. They had their friends crawl under it. They came back several times, and Steve always left Mary at home, because Mary was, 'I want this house.' Steve was being a negotiator and he was good." "He was tough," said Myers, "but we had figured out that he had definite instructions: Buy this house, or don't come home!" "I could hear her scream all the way from Virginia," Mrs. Myers remembered. "Then Steve said, 'Gee, I'm glad that's over,' and I said, 'Me too!'" "Everything in the Duck Pond is done strictly on emotion," said Mrs. Myers. "People buy strictly on emotion. It's a very romantic idea, too, an old house. It's very popular all over the country and I'm glad to see that there is a revival." The Kelley-Swords House was built in 1913 for Hartwell and Nellie Kelley. The Kelleys moved to this house from their home in Windsor, Florida, on the east side of Newnan's Lake in Alachua County. Hartwell Kelley was in the sawmill and crate manufacturing business there with his father, Dr. James Lawrence Kelley, his father's brother, George W. Kelley, known as Thurmon, and his brother, Forrest M. Kelley. The Kelleys had lived in Hartwell and Wrens, Georgia, before moving to the Windsor area in 1883. Although a settlement existed on the east side of Newnan's Lake the Kelley's were responsible for platting the town and building the community through their employment of laborers at their sawmills. Dr. Kelley named the new community Windsor, in honor of his wife, Belle Windsor Kelley, who was born in Baltimore MD. Hartwell and his brother, Forrest, were born in 1880 and 1884 and grew up working with their father-and his brother in the sawmills and orange groves. They also cleared "streets" and planted oaks along the "streets." The Kelleys had two sawmills near Newnan's Lake. The first one was close to Windsor and the other one was east of Prairie Creek. J.L. and his brother built a narrow gauge railroad on the west side of Newnan's Lake to University Avenue to transport logs to the sawmill from the log landing. Some logs sank and can still be found under the water nearly a century later. Fires ravaged the sawmills and the one at Prairie Creek was rebuilt as the Kelley-McDonald Sawmill in 1903. The third and final Kelley sawmill was built near the town of Gainesville at what is now known as North Main Street and 23rd Avenue. The great Florida Freeze of the late 1880s was so severe that the trunks of many of the fruit trees actually split open. This disaster-coupled with the sawmill fire-caused the settlement of Windsor to become nearly a ghost town. Only 2 or 3 families remained. Prior to the freeze, the Kelleys packed the fruit in crates made at their mill, hauled it overland to Palatka, where it was shipped by boat down the St. Johns River to Jacksonville and northern markets. Hartwell and Nellie Kelley purchased the lot at 628 North Bay Street in July of 1913. They built their house with the finest quality wood from their sawmill and made the structure of the house especially strong because it had to support an unusual feature for a frame house-a clay tile roof. Then and now there were no other frame houses, particularly two-story houses, with tile roofs. Most other buildings with tile roofs were brick or stuccoed and were generally not private dwellings. The Kelley's new house was quite spacious and well appointed, although it was not a particularly elaborate house. It had a parlor and a sitting room and a beautiful dining room on the first floor. The sitting room was directly at the end of the entry hall with the staircase, and the parlor was located to the left. The dining room was located between these rooms and was the most ornate room in the house with its paneling, plate rail, bay window, and serving window to the kitchen. All three main rooms featured beautiful fireplaces. The kitchen was also spacious and had a large walk-in pantry and a screened back porch with a maid's bath off the porch. The Kelley's four children, Gladys, Aline, Harvey, and George, Jr., were easily accommodated in the four or five bedrooms on the second floor. In addition to the bedrooms there was also a sleeping porch off the bathroom upstairs. The two girls shared one bedroom, Harvey and George. Jr., shared another, and the parents slept in the middle room on the south side. The fourth bedroom was the guestroom and the room west of the parents' room was a storeroom. The girls' room-and Hartwell and Nellie's room-had fireplaces. Harvey remembers what a chore it was to carry wood upstairs in the winter. He also recalls sleeping on the sleeping porch in the summer. When Hartwell built the original garage for the home, he designed it with a concrete floor and a sunken hole about 5 feet deep, and with concrete steps to the bottom that enabled one to work on the underside of the car once it had been driven into the garage. Hartwell had the very first automobile that came to Alachua County. Hartwell also invented the first self-starter for the automobile. It was operated by air compression, and consisted of a large air tank installed on the running board of the car. As the engine was running, it generated compressed air, and stored the air in the tank. The compression would be held in the tank for up to several weeks and was able to restart the engine. He formed a small corporation consisting of 10 of his closest friends, each of whom invested $1,000 (two of whom were Major W.R. Thomas and Dr. De Pass). At the time, that sum of money was considered quite large. Hartwell spent most of the next several years in Washington DC to obtain a patent, in an effort to sell it to the auto industry. Finally, he sold his patent to Mr. Nash, of the Nash Motor Car Company, for $10,000, and an agreement to receive a royalty on all sales thereafter. The sale came too late, however, because at the same time, Mr. Kettering was to invent the electric starter, which made the air compressor obsolete. The Kelleys did not live in the new house very long. The Gainesville mill burned down and George, Sr., lost heavily with that fire. The fireman refused to use city water to put out the fire since the mill was outside the city limits so it was completely destroyed. Although the fireman lost his job, the mill's loss took its toll on the Kelleys. They were forced to sell the house in 1917 and Hartwell went into a new line of business. He was an expert salesman and tried selling school supplies across the state for a while, but soon opened up the Kelley Music Store in downtown Gainesville. His main product was Edison phonographs and he did well with this item. Eventually, he wanted to buy his home back but the new owners-the Rolfs-would not sell. The Rolfs moved to Brazil in 1921 and the Kelleys were then able to move back into their house. But only as tenants. They lived there until around 1928 when Mr. Kelley closed the music store and moved into his father's home on what used to be called South Arredonda Street. There, they lived until a new home at Magnesia Springs was completed. Mr. Kelley developed Magnesia Springs into a first class bathing pool and tourist attraction. His wife's parents, J.B. and Martha Brown, had owned it since 1882 when they bought 640 acres with the springs and moved there from Terra Haute, Indiana, in hopes of helping Mr. Brown s Civil War injuries. Hartwell Kelley expanded the springs by hand-digging and pouring a 30 x 90 foot concrete pool in 1929. Mule drawn wagons hauled off the clay then, and again in 1932 when he further enlarged it to 50 x 152 feet with a 20 x 60 foot wading pool. Nellie also began the Magnesia Springs Water Company in 1929 and sold 5 gallon jugs for 50 cents each. Camp Blanding alone purchased 800 to 1000 bottles a week . Mrs. Kelley died in 1950 and Mr. Kelley sold the springs in 1964. He died in 1965 and production of the bottled water ceased in 1966. Mrs. Kelley's parents had died, and her sister Julia died in 1964. One of the Kelley's daughters, Gladys, who had married Birkett Jordan, had died in 1953 and George, Jr., moved to Miami Springs. Aline married Forrest Davies and moved to Gainesville. Harvey was the only one of the family who still lived near the springs after Mrs. Kelley's brother died in 1970. He still lives there today. The second family to own the Kelley-Swords house actually owned it for 27 years but only occupied it for five of those years. Peter and Effie Rolfs came from the midwest, both being born in Le Claire, Iowa, in the 1860s. Peter H. Rolfs received his education at the Iowa Agricultural College and obtained his bachelor's and master's degrees there in 1889 and 1891. After his August 1892 marriage to Effie Stone they moved to Lake City, Florida, where he was a professor of botany and horticulture at the Florida Agriculture College and Experiment Station, the forerunner to the present-day University of Florida. Their two daughters, Effie and Clarissa, were born in Lake City. The Rolfs then moved to South Carolina where Professor Rolfs taught at Clemson from 1899 to 1901. In 1901 they moved to Miami where he was in charge of the United States Department of Agriculture Plant Introduction Station and Subtropical Laboratory until 1906. When the University of Florida moved to Gainesville that year he was invited to become the Director of the Florida Agriculture Experiment Station, which he accepted. He then became Dean of the Agriculture College in 1915. 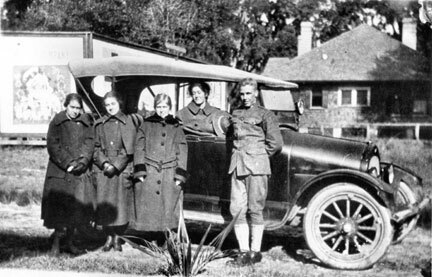 The above photo, entitled "Christmas 1917," shows the Rolf family in Gainesville. The Rolfs lived in the Kelley-Swords House through 1920. That year the United States Secretary of Agriculture recommended Dean Rolfs to the governor of Minas Gerais as the person who could develop a modern agriculture college for the State of Minas Gerais in Brazil. The Rolfs then moved there in 1921. Under the leadership of Dr. Rolfs a 1200-acre site,was purchased and construction started in 1922. Although a revolution in 1924 slowed the construction, classes began in 1927. Mrs.Rolfs had contracted an illness while in Brazil, and the family returned to the United States for a "vacation" early in 1929. She died in March at the new Alachua General Hospital. Dr. Rolfs had been made the Consultor Technico de Agricultura for the State of Minas Gerais so he returned to Brazil with his daughter, Clarissa. He moved back to Gainesville in 1939 and died here in 1944 at the age of 78. Rolfs Hall on the campus of the University of Florida was named after him. The Rolfs rented their home to only about 5 tenants in the intervening 23 years. The first tenant, Robert Lee, a carpenter, only lived there about a year until the Kelley family moved back in in the early 1920s. They moved out in 1928 and Professor Edward W. Garris moved into the house, now known as 628 Bay Street,with his wife and three children. He was a professor of Agricultural Education. He had received his bachelor's degree from Clemson in 1919, his master's degree from the University of South Carolina in 1924, and his doctorate from George Peabody College in 1926. E.W. Garris was the first Floridian to write textbooks for the vocational agricultural high school students in the state of Florida in 1928. Dr. Garris was noted in Who's Who in American Education in 1934, in American Men of Science in 1939, and Who's Who in America in 1950. He wrote or co-authored several books on agriculture and was the Head of the Department of Agricultural Education from 1927 until his retirement in 1962. The Garris family lived in the house until 1934 when it was occupied by the Alfred Crago family. Dr . Crago, and his wife, Laura, lived in the house with heir four children, Jean, John, Ann, and Richard, for about ten years. Dr., Crago, an Englishman by birth, had been raised in Nebraska and received his bachelor's and master's degrees from the State University of Nebraska in 1905 and 1917. In the interval he was principal of several schools in various Nebraska towns. After he received his master's degree he taught at Peru State College in Nebraska until 1927 when he entered the State University of Iowa from which he received his doctorate in 1930. He had become a professor at the University of Florida in 1929 as a member of the College of Education faculty. He taught educational psychology, personality development, child psychology, measurements and counseling. He was also Director of the child guidance clinic at the P.K. Yonge Laboratory School and organized the University Veteran's Counseling Center to aid returning WWII veterans to adjusting to civilian life. He retired from the University of Florida in 1950, and began private practice in Gainesville. In November of 1962 a section of Graham Hall dormitory was named after Dr. Crago on the University of Florida campus. The Crago's lived in the house until 1943 when it was rented by another education professor, John Ingle. A native of Virginia he moved here from North Carolina. He received his Ph.D. from the University of Virginia and was a professor of education at Washington State University. Dr. Ingle was also a psychologist for the Disabled American Veterans and a consultant for the Education Program at the Jacksonville Naval Air Station. Dr. Rolfs died in February of 1544 and his children subsequently sold the Kelley-Swords house to Martha Murphree Wallace in June of that year. The daughter of the former President of the University, she had returned to Gainesville with her children, Bob and Jenny, from Chicago in 1942 and was living at her brother, Audi Murphree's, house on NE 6th Avenue and NE 4th Street. Her original family home, the Murphree House, was also a few blocks away at NE 5th Ave. and NE 3rd Street, which made the house at 628 N. Bay Street an ideal home for her and her children. In addition to that, the superior grade of wood used by Hartwell Kelley in the construction of the home was reported to be mildew proof and non-allergenic, which was an important factor in the purchase of the house since Jenny was asthmatic. In fact, Jenny never did have any asthma attacks while she lived in this house. Mrs. Wallace was the first owner to occupy the house in nearly 25 years and she found that it needed some changes. Most important was that the five fireplaces did not keep the house sufficiently warm in the winter so she installed gas heaters. She also modernized the main bathroom located on the second floor, had bookcases installed in the living room, formerly known as the sitting room, and wall papered various rooms in the house including two of the bedrooms. She also screened in the front porch and planted a ligustrum hedge as well as doing other landscaping. One outbuilding was lost, as the original garage burned down during the Wallace family's tenancy. Mrs. Wallace remarried and sold the house in 1949 when she moved to Coral Gables. James Thurston, a University professor, only lived in the house for 3 years before selling it to the Swords Family. The Swords family had lived a few blocks away at 116 NE 6th Ave. until their purchase of this house. Mrs. Swords had died in 1950 and Mr. Swords and the three children moved here in 1952. The daughters, Mary Ellen and Louise, operated a dining room in their former residence and they continued its operation in their new home. Their brother, L.Cramer Swords, Jr., was an artist, while their father was a bookkeeper until his death in 1958. The Swords Sisters Dining Room served evening meals only, and was more like a boarding house than a true restaurant. There were no menus, patrons were served whatever was the main meal for the evening, and most attended every dinner for all five days meals were served during the week. Diners were mostly bachelors, spinsters and widows, as well as some people from the Hotel Thomas. Preacher Gordon was a regular, and J. Wayne Reitz was also seen there. Approximately 35 people were served at tables set up in the former parlor, dining room and sitting room. The sisters discontinued the dining room operation sometime in the 1970s. After L. Cramer, Jr. died, they sold the house to Jane and Gardiner Myers in 1983 and moved into the Bailey Retirement Center on NW 6th Street in Gainesville. The Kelley-Swords house was beautifully renovated by Jane and Gardiner in 1985 and was one of the featured historic homes on the March 1986 Spring Pilgrimage. Warranty Deed, W.R. and Kate Thomas to Nellie Kelley, July 19, 1913, Deedbook 91, p. 90; Interview with Harvey Kelley, January Z8, 1986. F.W. Buchholz, History of Alachua County, Florida: Narrative and Biographical, Part II. Biographical (St. Augustine: The Record Co., 1929), p. 372; Harvey Kelley Interview; The Florida Times Union, April 7, May 20, June 13, June 24, July 9,1903. Harvey Kelley Interview; Interview with Jenny Stringfellow, January 30, 1986. The Gainesville Sun. July 20, 1975; Harvey Kelley Interview. The Gainesville Sun, May 28, 1950; July 20, 1975; June 6, 1965; April 1974, April 23, 1953; February 18, 1970; Harvey Kelley Interview. The Gainesville Sun. April 1, 1929; Peter Henry Rolfs Biographical Sketch, typescript. The Gainesville Sun, January 24, 1934. The Gainesville Sun, April 2, 1929; February 24, 27, 1944. The Gainesville Sun, July 1, 1981; The Gainesville City Directory. The Gainesville Sun, October 20, 1928. The Gainesville Sun, July 1, 1981. The Gainesville Sun, November 15, 1971. Warranty Deed, Martha M., Troxler to James and Agnes Thurston, July 20, 1949, Deedbook 265, p. 284. Interview with Sara Gray. January 24, 1986; Warranty Deed, James and Agnes Thurston to Mary Ellen, Louise, and L. Cramer Swords, Jr., August 7, 1962, Deedbook 299, p. 411. Interview with Mary Ellen and Louise Swords, February 6, 1986. This spacious two-story frame vernacular home displays a prominent front dormer and a broad porch with solid square columns. The interior contains impressive wainscoting, a wooden stairway, classic built-ins, original chandeliers, leaded glass hall windows and five fireplaces. The original owner, G. Hartwell Kelley, owned a music store and ran a lumber sawmill. From 1952 to 1984 the Swords Sisters, Mary Ellen and Louise, ran a private boarding house and family-style restaurant here. A group of 25 or so regulars ate their evening meal there during the week, forming a sort of dinner club, with others coming by invitation. Students could eat for $10 a week and one of them, Steve Reid, returned decades later to purchase the home. 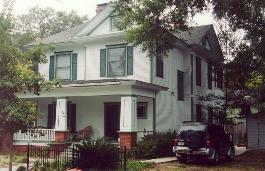 G. Hartwell Kelley, the original owner of this two-story frame house that was built in 1913, owned a Gainesville music store and also ran a sawmill. From 1952 to 1984, the Swords sisters, Mary Ellen and Louise, ran the place as a boarding house and a family-style dining room that was a popular gathering spot for professionals and students alike. Years later one of those students, now Dr. Steve Reid, bought the house for his family home and lived there for about six years before moving to the neighboring Gracy Mansion. Jane and Gardiner Myers renovated the house in 1985, restoring the original woodwork, adding a master bath and closet on the second floor, and remodeling the kitchen. The house is currently owned by Phillip Tomporoski, a visiting associate professor of psychology at the University of Florida, and his wife, Dr. Regina Smith, an associate dean for research in the University's College of Medicine. What attracted the young couple to the house when they moved here from Alabama in the summer of '92? "The neighborhood, the kind of house it is," said Dr. Smith. "My fondest dream is to be stuck in the '50s and what life was like then, with sidewalks and churches with bells ringing on Sunday mornings, front porches, parks...that sort of thing. It's the kind of environment I want my daughter to grow up in." Dr. Smith said it was hard to track down exactly what she had in mind, but as soon as she saw the old house just down the street from the Thomas Center she knew it was the one she wanted. "I walked in and saw the chandelier in the dining room so similar to the one my grandparents were married under, and I thought, 'It's an omen.' I really did." Although the house was in "very, very good shape" when they bought it, Dr. Smith said, she and her husband are now in the process of beginning to strip off the layers of exterior paint. "That wood is gorgeous," she said. "There's not a knothole in it. But, of course, the man who built it owned a sawmill." As far as the interior goes, Dr. Smith said her favorite thing is probably the house's woodwork. "It's unique, really. You just don't find that kind of craftsmanship anymore. The hallway is absolutely beautiful, the heart pine floors, and the five fireplaces and mantels that are such fun to decorate at Christmas." Tomporoski said he's always liked the pocket doors that allow them to close off the first-floor rooms from one another. "You can just light one of the small gas heaters-it's very efficient." Although the house is now up to being a Pilgrimage showcase, it had fallen on hard times after the Swords sisters were gone, falling into use as student housing. "We think it was a sort of a hippie enclave for awhile," Dr. Smith said. "A friend says she can remember seeing strange drawings on the walls and hammocks in the bedrooms."